When kids have trouble staying regular, they often feel uncomfortable. The probiotic in Kids Regularity formula provides a safe, gentle and drug-free way to help restore regularity and keep kids’ digestive systems running smoothly. 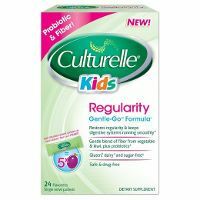 Culturelle® works naturally with your child’s body and can be easily added to your child’s food, making it the perfect choice when changes to diet alone are not enough.